The ragged sea hare, Bursatella leachii De Blainville, 1817, is a medium to large-sized (usu-ally from 50 to 100 mm, up to 150 mm) benthic opisthobranch mollusc (Voss, 1980; CIESM, 2002). It is a circumtropical species found nearly worldwide in warm temperate to tropical marine environments and it is common in intertidal and subtidal sheltered bay and estuarine habitats with sand or muddy bottoms, and are a frequently en-countered component of tropical and subtropical sea grass and mangrove communities (Lowe and Turner, 1976). According to CIESM exotic atlas, mode of introduction is either by ships from the tropical Atlantic or via the Suez Canal (i.e. Lessepsian), and in the Mediterranean, B. leachii is very common from the eastern Mediterranean Sea to the Italian coasts in the western Basin, only known from an area between Taranto Sea, Sicily, Naples, Sardinia, Malta and Tunisia (CIESM, 2002; Zakhama-Sraieb et al., 2009; Gravili et al., 2010). Despalatovic et al. (2008) reported that this species was occasionally observed in the area of the middle Adriatic (around Split and Hvar Island) in the last two decades. In Turkish coasts, this species was recorded first by Swennen (1961). Recently, nine speci-mens of B. leachii from Inciraltı coastline, Izmir Bay were found by Kazak and Cavas (2007). On December 07th 2010, more than 200 individuals of B. leachii aggregated for repro-duction at a depth of about 50 cm in the Urla, Is-kele fishing port (38° 21.9’N-26°46.3’E), Izmir Bay (Figure 1). A total of 40 specimens, ran-domly chosen were collected from hard substra-tum (i.e. on rocky place) by a scoop net for total length (TL, cm) measurements. After the meas-urements, live specimens were released back to the sea. During the sampling period, sea water temperature and salinity were measured by YSI 30/10 SCT meter. 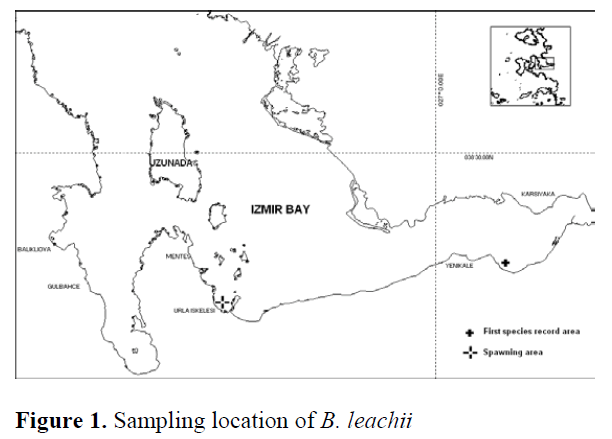 Total length distribution of B. leachii (Figure 2) was ranged from 6 cm to 15 cm (mean: 11.1 ±1.7 cm) and mean salinity and temperature of the reproduction habitat were 34.9 ±0.1‰ and 18.3 ±0.3ºC, respectively. The shallow habitat consists of sand, rock, and patches of algae, Cys-toseira spp. 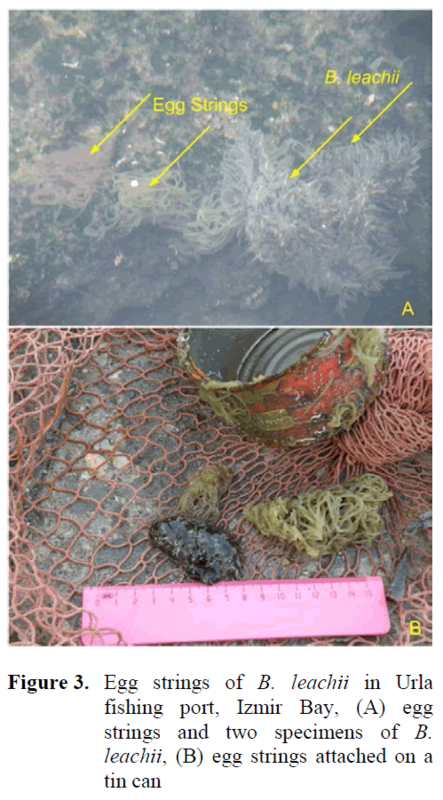 The breeders of B. leachii spawned their spaghetti-like benthic egg strings that were orange-yellow in color and on different materials such as stone, rock, brick and a piece of fish net even on tin can (Figure 3). However, we ob-served the reducing ragged sea hare in the area until end of the May 2011, and then they disap-peared. 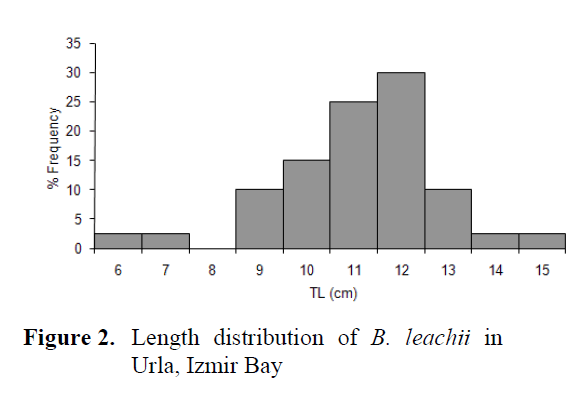 Kazak and Cavas (2007) reported that only existence of B. leachii, the mean size of 9.2 ± 0.21 cm as a little smaller than that of this study, but no report on reproduction of ragged sea hare in Izmir Bay. Additionally, Çınar et al. (2005) mentioned from the B. leachii, referred to Swen-ney (1961), amongst the alien species on the coasts of Turkey. Therefore, the current study represents first report on the reproduction of a Lessepsian ragged sea hare, B. leachii in the Iz-mir Bay, Aegean Sea. We thank to Dr. H. Şen for the measurement of sea water T-S and for his comments. CIESM., (2002). CIESM Atlas of Exotic Mol-luscs in the Mediterranean (Available at http://www.ciesm.org/atlas). Çınar, M.E., Bilecenoglu, M., Öztürk, B., Katağan, T. and Aysel, V., (2005). Alien species on the coasts of Turkey, Mediterra-nean Marine Science, 6:119-146. Despalatovic, M., Grubelic, I., Nikolic, V., Dragicevic, B., Dulcic, J., Zuljevic, A., Cvitkovic, I., Antolic, B., (2008). 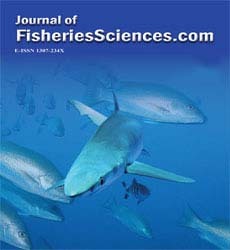 Alloch-thonous warm water species in the benthic communities and ichthyofauna of the eastern part of the Adriatic Sea. In: Briand, F., Ed. Climate warming and related changes in Mediterranean marine biota. CIESM Work-shop Monographs No. 35, Monaco, 152 p.
Kazak, M., Cavas, L., (2007). On the occurrence of Bursatella leachii de Blainville, 1817 in Izmir Bay, Turkey, Mediterranean Marine Science, 8(2): 87-90. Lowe, E.F., Turner, R.L., (1976). Aggregation and trail-following in juvenile Bursatella leachii plei (Gastropoda: Opisthobranchia), Veliger, 19: 153-155. Swennen, C., (1961). On a collection of Opisthobranchia from Turkey, Zoologische Mededelingen, 38: 41-75. Voss, G.L., (1980). Seashore Life of Florida and the Caribbean. Dover Publications, Inc., New York, 199 p.